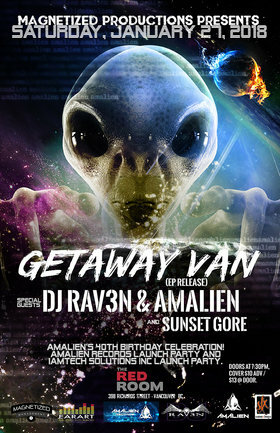 Getaway Van's EP Release Party! A brand new project out of Vancouver, BC, these guys are fuzzier than your parents shag carpet. Check out their teaser on their Facebook page! AMALIEN's 40th Birthday Celebration! AMALIEN RECORDS Launch Party and IAMTECH SOLUTIONS Inc Launch Party. Saturday, January 27, 2018, at Red Room Ultra Bar, 398 Richards Street, Vancouver, BC.